The City of Kent Arts Commission’s Centennial Center Gallery (400 W. Gowe St.), hosts the work of artists Juan Alonso-Rodríguez and Terrell Lozada through Feb. 26. The show is free and open to the public, Monday through Friday, 8 a.m. to 5 p.m. An opening reception, also free and open to the public, will be held TONIGHT – Tuesday, Jan. 9 from 6:30 to 8:00 p.m.
Terrell Lozada’s love of language and fascination with words and fonts started early. Her first collaboration with another artist, in the second grade, was an alphabet design based on squares and triangles. The font was immediately popular, widely copied and resulted in a trip to the principal’s office. 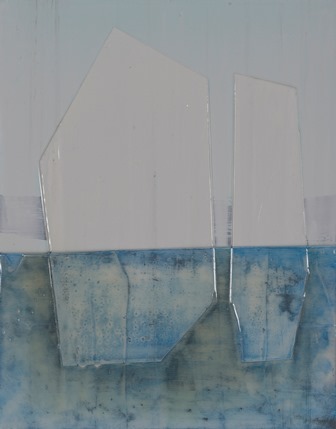 In her studio practice, she alternates between sculpture and painting. 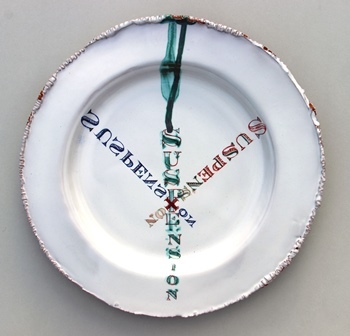 Her relatively recent exploration of ceramics allows her to combine color and form. She lived in Italy when young and grew up with tin-glazed terracotta, a technically challenging medium. The white base glaze is akin to painting on a layer of dried talcum powder, and the metal oxides used to paint the images are a different color in their raw form than when fired. Her aesthetic fulcrum is the late 18th century and she’s obsessed with French architecture and interiors of that period. In the 18th century, tin-glazed dishes were often hung on walls. This series is intended to be wall mounted; the plate hangers are hand hammered copper. Centennial Gallery shows are produced by the City of Kent Arts Commission.